Home » Blog » How Safe is Your Drinking Water? 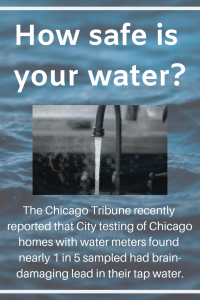 The Chicago Tribune recently reported that City testing of Chicago homes with water meters found nearly 1 in 5 sampled had brain-damaging lead in their tap water. Mayor Rahm Emanuel’s water commissioner acknowledged that the city continued installing new meters after learning about the alarming results. 1 in 5 had brain-damaging lead in their tap water. The Water Quality Association reports that a typical American uses 80-100 gallons of water every day. That number includes not just drinking water, but also the water used for washing, watering lawns, and waste disposal. With so much of one resource coming into our homes, it is important to know the quality of that water. Some issues related to water quality in your home are easily detected, but some are not. Is the drinking water in your home discolored or have a funny smell? If you are sensing that you have an issue with your water, you should have the quality tested immediately. But, not all issues can be found using your senses. It’s not as easy to detect the microbial and organic contaminants. Don’t wait for someone in your community or even your home to get sick or begin to show the many signs of exposure to contaminated water. Have your water supply tested and start using the correct filters in your home to make sure you are getting the best quality water possible for your family. After hearing such terrifying numbers from the City of Chicago, it’s time to focus on how lead may be effecting your home. Here is what we need to know… Lead is a naturally occurring metal found in our environment, but not normally in water supplies. It is seldom found in water sources such as lakes, rivers or even treatment plants. The lead in our water supply that ends up in your water glass comes from the old and corroded pipes and plumbing that carry water into our homes. Exposure and consumption of lead and other toxic materials in our drinking water has negative effects on our bodies. Some common health concerns include damage to the eyes, brain, liver, kidney and blood to name a few. In recent years, regulations have been put into place to control the quality of pipes and plumbing used to transport water, but there are years and years of plumbing in use that are not considered “lead-free”. Older homes are more likely to be in danger, but the risks are far too great not to take additional measures to ensure our household water is safe for our families. To alleviate the problem of high levels of lead, we recommend The Countertop Filter #A40L or the Undercounter #U40L with the replacement filter #F40L These products are excellent for reducing lead in the water. That ‘L’ in the product number is specifically for lead, so you know these products are designed to lower your exposure to LEAD, chlorine, cysts and foul taste & odor. Please contact us with any questions about ways to treat your water supply is safe. In addition to our basic every day systems, we provide custom-designed systems to solve specific water problems. Let’s work together to keep you and your family safe.